Smart / Microprocessor controlled charger. The unique construction and sealing techniques of VMAX tanks guarantee leak proof operation in any position with no adverse effect to capacity or service life. VMAX tanks are classified as non-spill able, non-hazardous, dry batteries making them NOT restricted for Surface, Maritime and Air Transport. VMAX tanks utilize an electrolyte suspension system consisting AGM (Absorbed Glass Matt) of a high porosity that totally absorb and contain the electrolyte. No silica gels or any other contaminants are used. There is no need to check specific gravity of the electrolyte or add water to VMAXTANKS™ during float service life. The extra strong ABS container reduces case bulging and plate warping, ensuring long life and high performance. All VMAXTANKS™ are equipped with safety release valves, designed to operate between 0.98-196.1kpa and automatically reseal. Hence, there is never an excessive accumulation of gas within the battery. Heavy duty lead tin alloy grids provide an extra margin of performance and service life in either float or cyclic applications, even after repeated over discharges. VMAXTANKS™ have an expected life span of 8 to 10 years in float service applications. The self discharge rate of the new VMAX tanks at room temperature is approximately 1-2% of rated capacity per month (compared to 2-3% for most other AGM batteries and 15-20% for Lead Acid batteries). VMAXTANKS™ may be operated over a broad range of ambient temperatures. VMAXTANKS™ Ultra Low Resistance make it up to 99% efficient (compared to 85-95% as in Lead Acid Batteries and 97% in most other GEL and AGM batteries). 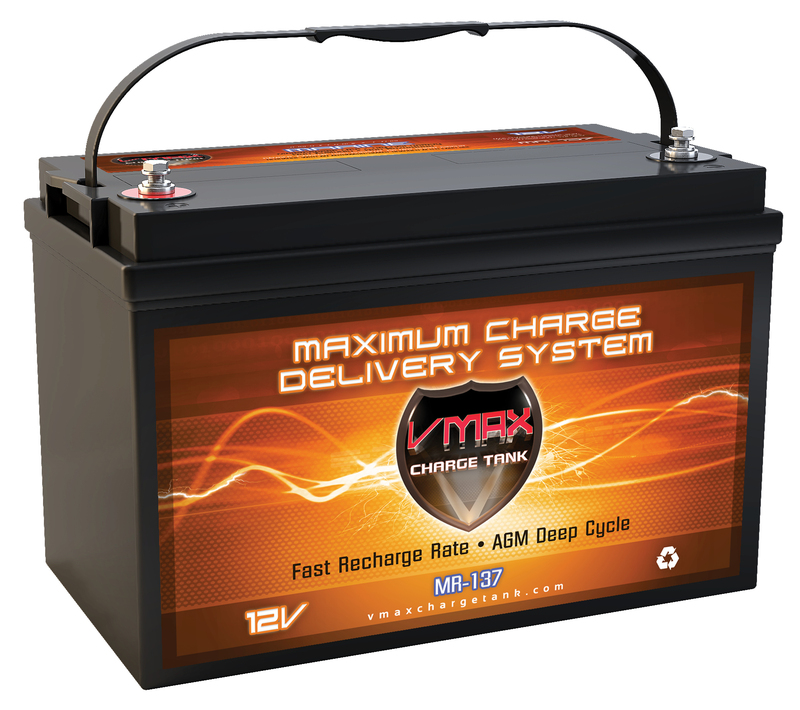 Don’t settle for an average Lead Acid Battery, upgrade to a VMAX CHARGE TANK premium AGM deep cycle battery! Zero complaints at all after almost 18 months. "So far so good... this has been a great battery with a ton of storage power for my 55lb thrust trolling motor. I wanted a battery that would power my boat all day without worrying about having it go dead and standing me across the lake. So far I have been out several times almost continuously using the battery for six hours or more and have had plenty of power. Of course I have a high efficiency Minn Kota Endura Max motor matched up to it... Works Great!! Don't forget to buy a high quality AGM charger to protect your battery investment and it should last a long time." "Plenty of power and takes charges well. built like a tank. Would recommend to anyone. more amp/hours than any other brand I could find." "I purchased 2 of these to run my motorhome when the generator isn't running. They are working well so far. They are certainly working better than the flooded battery they replaced." "I bought this for an ArkPak. I've used it several times now and am very happy with it. I was able to run a Fantastic DC fan (mostly on low but occasionally on medium and high but running 72 hours straight), recharge a 15" Macbook Pro laptop several times and charge two iPhones several times. I also used it to top off a charge in a Goal Zero Lighthouse 250. The output was 12.7 volts to start and only dropped to 12.3 volts over the 72 hours. I am very pleased because I was hoping to get a three day weekend's worth of camping out of it while not dropping the output voltage below 11."